If you need to provide debugging of your CoreData apps, you can track what is happening statement by statement by modifying the Scheme. In XCode, click on Product in the menu, and then Scheme and then Edit Scheme (or just Cmd <. For the Debug Run mode, choose the Arguments tab and add to the Arguments passed at launch. Add -com.apple.CoreData.SQLDebug 3 and hit OK. The value 3 should provide enough information but higher numbers provide more verbosity. Within WebCalendar, the timezones are incorrectly stored as EST. I’ve moved across to using a Macbook from Windows XP. While I’m generally happy about this, productivity isn’t where it should be. I’m gradually getting used to the interface, and quite relieved at some of the things I no longer need to do to make Windows perform. On Windows however, I did have some nice tools that made my working life quite productive. One of these was pocketmod. It’s a free utility to collapse eight pages of pdf content into an easily foldable format. In my case, I use it as a handy todo list, reference guide, and general productivity boost. On Windows, it’s a simple download. You print your material to a pdf file, and then process that file into a pocketmod format. I didn’t think it could get much easier. However, I was wrong. On the Mac, there is no pocketmod. Apparently there is, but I can’t seem to find it. Fortunately, some very clever people have managed to use a couple of opensource tools to embed the whole process into a simple extension to the Mac print process. Now instead of printing to pdf, and then processing the resultant file to pocketmod format, I just print directly to a pocketmod file. I am loving the Mac more and more. There’s quite a good description of how to do it here so I won’t expand on this in copious detail. However, for those looking to do this a new with the current version of Multivalent from sourceforge, you will find that it’s a non starter. Unfortunately, the current version’s jar does not include the class files for PDF manipulation, and the older version of the jar is not available on sourceforge. The idea of a maturity model is not new, and I’ve seen a number of these related to SOA, Information management, and Service Management. However, I couldn’t locate much around Collaboration. I did find a number of discussions that showed an evolution of sorts around tool types and then I stumbled on this. As you can see, it doesn’t provide much context. However, I did like it for a number of reasons. Firstly, it wasn’t looking at the subject as an evolution of product functionality – rather an evolution of behaviour. This aligns similarly with the other approaches I’ve seen, but it also identifies that (as with most areas in life) maturity is a reflection of behaviour appropriate to the situation. What it lacked however is more detail into how people might experience these levels differently, and what the journey along the maturity scale would require. In other words, an organisation may conclude that it is probably ‘Tools Oriented’ but why – just because it tends to be application centric? I’m not convinced that this is anywhere near sufficient. 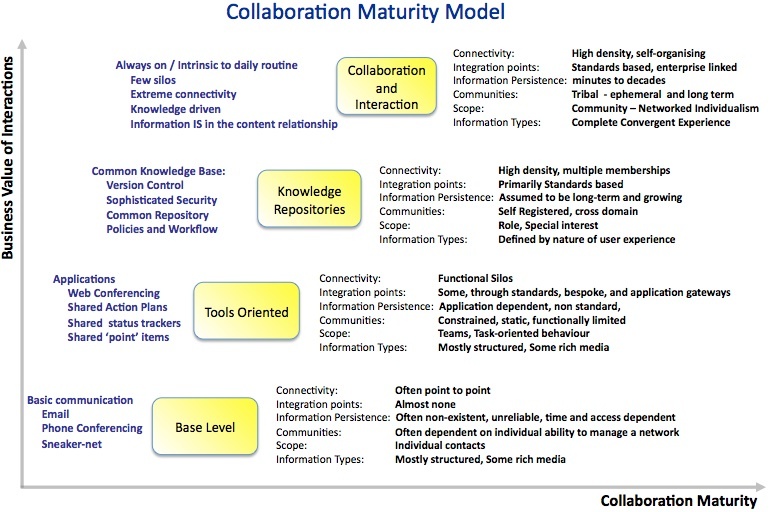 Secondly, if an organisation has a strategic desire to move up that maturity level, then how do they get to a position where they are ready to comfortably work within a ‘Knowledge Repository’ way? This is not just a conceptual migration path, but one grounded in infrastructure requirements, cultural implications, and an understanding and commitment by leadership to do things differently. Information Types: What sort of information is being conveyed? Is it structured, referential, rich, media based? Scope: How many people are affected by, or bought into this approach? This could be a one-to-one interaction, or alternatively based on role (e.g. sales), task (e.g. submit expenses), or self defined communities. Communities: What would a community look like using this approach? It could be a community of one where I simply keep all my information to myself, and we all have information stores that satisfy that category. It could be a well-defined (and private) community with as few as three people, or it could be an all-encompassing community that grows or shrinks on an hourly basis. Information Persistence: How relevant is the information being communicated? How long should it be kept? Is it for public consumption? Integration Points : How much interaction takes place with other systems? Security is relevant here. What is used to allow that integration? How standards based are these links? Connectivity: At the lowest level, no one connects to any other, whereas at the highest level, everyone is connected to everyone else. Social Network analysts would call this ‘Density’. It’s the dynamics of connectivity such as people who are hubs and outliers that really bring the value of collaboration to the fore. And finally, how do each of these align to the maturity levels? Scope Individual contacts. The world revolves about you. Communities Relies on an individual’s ability to manage contacts and make conceptual connections between them to create value. 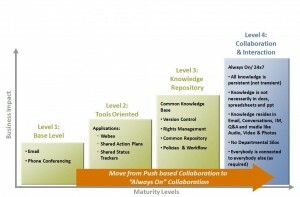 Collaboration and Integration Information Types Complete convergent experience. Device independent. What else occurs as maturity increases? Security Flexibility: Increases as a function of maturity. That doesn’t mean that security is less important, but rather that the nature of information being shared, and the resultant ability to promote innovation must be balanced. Not all information, and not all interactions are the same, so why use a standard security model which assumes that they are? Community Life: Decreases as a function of maturity. Many more communities, more Darwinian in nature. Useful/popular communities thrive and evolve, and unused ones die out. At lower levels of maturity, the communities are by nature more well defined, and therefore last longer. However, their community impact is lower as they touch fewer people. Push versus Always-On: Increases as a function of maturity. At the lower levels, communication is generally user driven such as ‘Send this mail’, or ‘Check my feeds’. At the highest levels, the opportunities to proactively drive content out to the user base is pervasive. This is highly context sensitive as well. For example, linking a GPS position with your data in a dating system such as likes and dislikes could notify you that a potential romantic partner is coming directly toward you on a street. The same system could notify the other person as well. Creativity & Innovation: Increases as a function of maturity. With many different styles to communicating, a broad user base will choose their own set of tools. However, the information to a great extent is an underlying asset to most of these. Twitter for example, can feed into Facebook, and LinkedIn, and people who would never ‘tweet’ would still gain from those interactions. The choice of user response and how they interpret the information in the context of their interface is what helps drive creativity and information. Collaboration medium life cycle: Decreases as a function of maturity. At the lower levels, tools are developed in a traditional manner to allow aspects of collaboration to take place (e.g. mail client, instant messaging client) and collaboration is a side effect of the interface. At the highest levels, collaboration is he product, and a multitude of functional widgets are used and connected creatively to facilitate this. Modern email clients are incorporating this mind-set and the edges are blurring. However, in doing so, they cease to be a pure email client, and more of a collaboration platform, which is a more mature deliverable. Widgets are developed quickly, and tested against collaborative use cases. Those that thrive survive, and those that don’t won’t. It is the long tail in action. So how does this look as a single image?